On 26.09.2011, the Ghana Football Association published the squads for the GLO Premier League 2011-2012. In this post, I will make some comments about Heart of Lions FC. It doesn’t seem that Heart of Lions FC has made any big-name signings before the new season. The CEO of Heart of Lions FC has stated that the club has “done recruitment of young and talented players whom we will groom to be big players”. Personally, I don’t think Heart of Lions FC will have a very good season. Their key players, burly striker Gilbert Fiamenyoh, goalkeeper Joseph Addo and attacking midfielder Bright Nsiah all looks to be unsettled at the club. Interestingly, none of them is named in the published squad list, but I believe they are all still at the club. Bright Nsiah is most certainly still at the club and the playmaker scored the only goal of the match when Heart of Lions FC won 1-0 against Wassaman United FC yesterday. 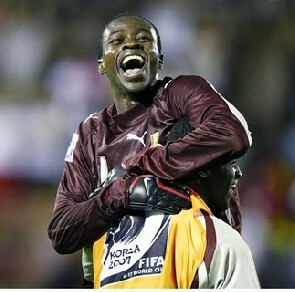 The picture is of goalkeeper Joseph Addo and is taken from Ghanasoccernet. Lions has also lost the services of some key performers from last season, including versatile defender Kweku Andoh, midfielders Gladson Awako and Isaac Morgan, who have all joined Berekum Chelsea FC, and central defender Godfred Rockson who joined Medeama SC. Heart of Lions FC has apparently brought goalkeeper Nana Bonsu (born 01.12.1988) to the club. Bonsu was linked to Asante Kotoko FC earlier this summer and he was previously regarded as one of the most talented goalkeepers in Ghana. He will most likely be second choice this season as Joseph Addo is highly regarded. Full-back Solomon Addy (born 09.04.1989), formerly of AshantiGold SC, should become a great acquisition for Heart of Lions FC. Prosper Avor and Badu Richard Asiamah should also play regularly in defence. Asiamah is not named in the official squad but participated in the “GHALCA Glo G8”, a pre-season tournament. This is also the case for experienced midfielder Lawrence Adjah Tetteh and star player Bright Nsiah. I believe that Asiamah and Tetteh are still with the club. The midfield looks strong with Nsiah, brilliant left-winger Daniel Acquaye, skillful right-winger Ofosu Amoah and the more defensive oriented Emmanuel Anarfi and Godfred Asante. The midfield is arguably the strongpoint of the team. Fiamenyoh is the top striker but I expect quite a few goals from his striking partner Daniel Kofi Bonsu. Razak Noah Ofori, an 18-year old former reserve team player at Hearts of Oak SC is also an interesting player, as is attacker Prince Opoku who I believe can have a breakthrough this season. Heart of Lions FC has signed several rather unknown players, including John Nanitey (born 25.11.1990), formerly of Eleven Wise FC and a Togolese player called Edem Nyabu. Benjanin Adjokatse, Sunday Afatsawu, Elliot Afotey, Bless Agbeve, Prince Opoku Agyemang, Kadri Alhassan, Enoch Amaglo, Mohammed Anaba, Michael Kojo Antwi, Jonathan Atitiati, Fadi Benjamin, Paul Daniels, William Darko, Prosper Donkor, Jerry Kaye, Clement Kwabena, Maestro Mensah, Michael Ofori, Prince Sarpong, Osman Seidu, Simon Tetteh.